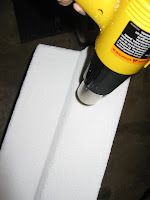 Use a heat gun over the entire exterior surface of the styrofoam box. This will harden the exterior and prevent it from denting. You can use the heat gun to make imperfections in the surface so it more closely resembles rock or concrete. I recommend wearing some kind of mask, as the fumes that come off the styrofoam are probably not good for you.